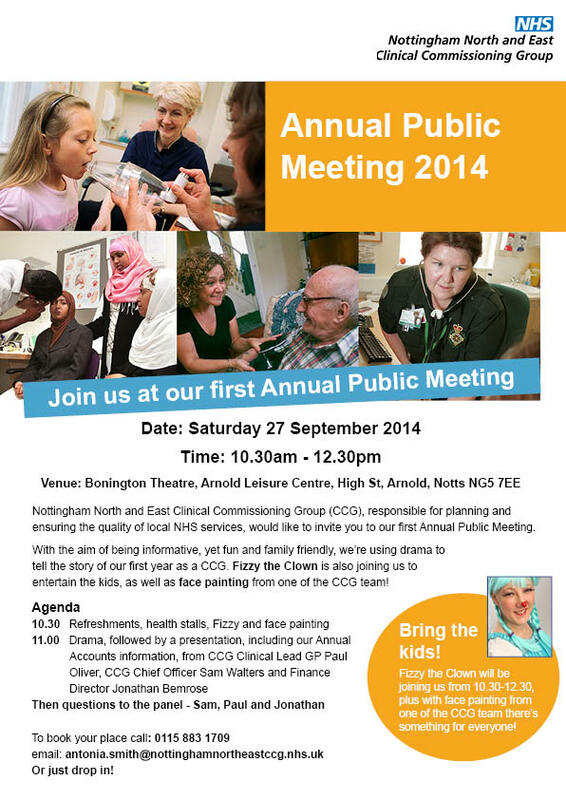 We’d like to invite people who live in the Nottingham North and East area to join us at our Annual Public Meeting and celebrate the CCG’s achievements. The event, on Saturday 27 September, is an opportunity to find out more about our work over the last year. It will take place between 10.30am and 12.30pm at the Bonington Theatre (in the Leisure Centre), High Street, Arnold, NG5 7EE. Meetings like this have a reputation for being a bit dry, so this year we thought we’d try something a bit different and inject some family fun into proceedings. A local theatre company will be using drama to tell the story of our year, while Fizzy the Clown and face painting will keep the kids entertained. We hope it will be a lively, entertaining and informative event, so please come along. From 10.30 there will be stalls, tea/ coffee and biscuits and a chance to talk to some local healthcare organisations. Following this there will be a presentation of the Annual Accounts, an overview of the year and plans for the future, supported by an engaging drama performance. Then you’ll have the opportunity to ask questions of our Clinical Lead GP Paul Oliver, Chief Officer Sam Walters and Director of Finance Jonathan Bemrose.